Captain Alfred Carbert Bastedo paid the ultimate sacrifice on April 23, 1915 on the opening days of the 2nd Battle of Ypres. Although sporadic attempts to use noxious substances had been tested by the Germans in 1914, this was truly the first use of poisonous gas in a major military action. The remains of Captain Bastedo may have been recovered from the battlefield, but they have yet to be identified, thus he is commemorated on the Ypres (Menin Gate) Memorial as having no known grave. Captain Bastedo was one of the first men born in Milton to enlist in the Canadian Expeditionary Force (CEF). He had been a leader with the pre-war militia unit “20th Halton Rifles” for more than 6 years. At the outbreak of the war, he had just completed his 3rd year of study at University College in Toronto. He was on summer vacation, visiting his fiancée (Grace Craig) in the Ottawa area when war was declared in August 1914. He announced to his friends that he was going home to join his regiment and to serve his country. Captain Bastedo would be instrumental in the recruitment of dozens of young Milton men who would serve with him in the early days of the war or subsequently attest to the 164th Infantry Battalion. Complete details on Captain Bastedo’s attestation to the CEF and subsequent, albeit short service in the Great War, are available on-line from Library and Archives Canada (Bastedo File). He attested at the training camp at Valcartier, Quebec on September 22, 1914. 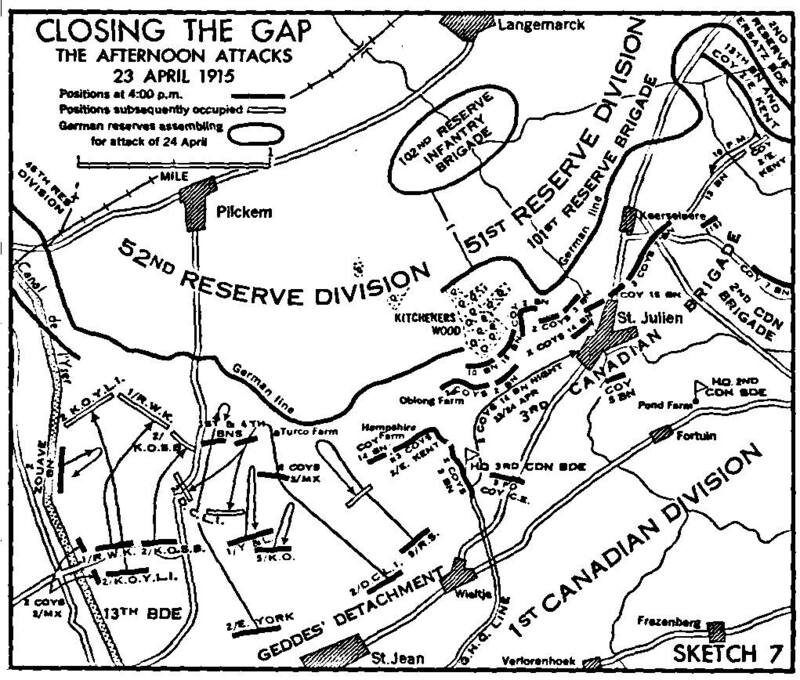 Initially with the 4th Battalion (1st Brigade, 1st Canadian Division) he was transferred, after further Officer’s Training, to command a Company of the 1st Infantry Battalion on April 2, 1915. He would be killed in action at Ypres within 2 weeks. Prior to his death, the war had already claimed 886 Canadian’s (512 in Belgium, 129 in France, 137 in Canada, 104 in the United Kingdom and 4 elsewhere). Bastedo was the 13th CEF Captain to fall, 8 of whom had been lost in Belgium in April 1915. The 1st Infantry Brigade was still training in Army Reserve at Vlamertinghe (2 miles west of Ypres) when the German’s launched the first gas attack on April 22, 1915 near St. Julien. 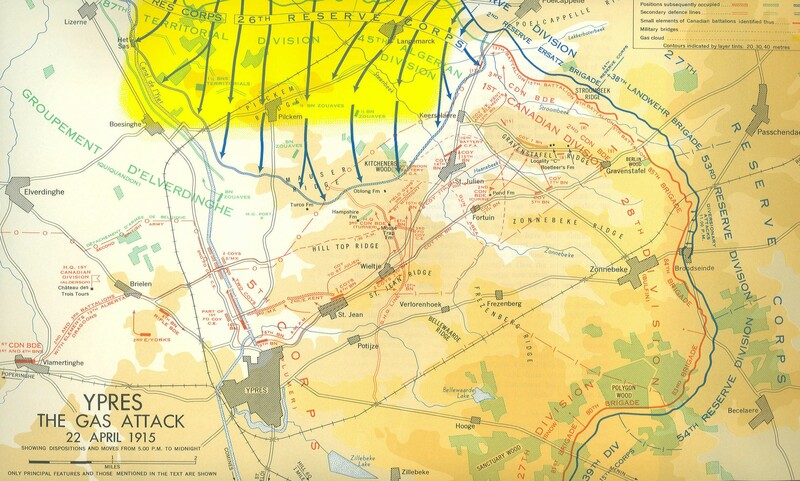 The 1st and 4th Battalions would be brought back across the Yser Canal to assist in the repulsion of the German advance north of Ypres, along the Pilckem Road. The 1st Battalion would cross at the Pontoon Bridge and pass through the Aid Station at Burnt Farm. It was near here, at Essex Farm, that John McCrae would write the famous poem “In Flanders Fields” only a few days later. Captain Bastedo may have been treated for his wounds at the same Aid Station and later buried in the Essex Farm Cemetery, from which many graves were subsequently lost. There are many other cemeteries in the area, including likely candidate sites at New Irish Farm Cemetery and Divisional Collecting Post Cemetery, as well as less likely sites at Track X Cemetery and Buffs Road Cemetery. All of these are being searched for any records relating to an Unknown Captain of the 1st Canadian Infantry Battalion. 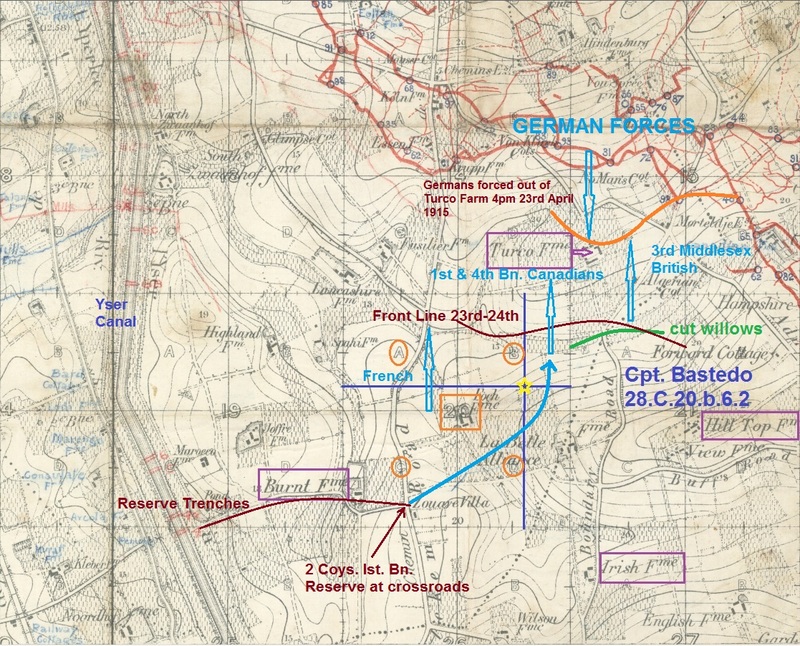 We do know that Captain Bastedo fell at Trench Map Coordinates 28.C.20.b.6.2 (GPS Coordinates: 50.8774, 2.8938 or 50°52’38.63″N 2°53’37.69″E), which is marked below, along with the path of the 1st and 4th Battalions to block the German advance. Some reports say he was buried at this location in a battlefield grave and others say that he was wounded there but taken to an aid station, where he subsequently died. All possible locations are being checked. The detailed documents related to the search can all be found in his file: Bastedo, Alfred Carbert – Captain. Soldiers lost in the Great War (WWI) with “No Known Grave” are commemorated on a number of memorials, based on where they were when they fell. The Menin Gate Memorial in Ypres records the names of 6,928 Canadians who gave their life in Belgium (including French Flanders). The Vimy Memorial in Pas-de-Calais, France lists the names of 11,161 Canadians, many of whose remains were recovered but not identified. To date we have recorded the names of 203 Canadians who served in the British Air Services (RFC, RNAS, RAF) who have yet to be identified. Another 193 are listed on the Halifax Memorial, as they were lost at sea or have unknown burial locations in Canada (died in training, died of wounds, accidental deaths). Although not part of Canada at the time of the war, the names of 587 Newfoundlanders are named on the Beaumont Hamel Memorial (The Somme, France). The ability to now locate and identify men that were lost in the mud and blood of battle more than 100 years ago is a direct result of the digitization of the archives of the Commonwealth War Graves Commission (CWGC) and our work to computerize the searches by mining the data from the servers (The Unknown Project). The key to the work is to identify possible candidates based on the information contained in their casualty reports, which is then compared to the CWGC “Concentration Reports”, as well as site specific information from Battalion War Diaries and Period Trench Maps. For example, this concentration report has details on men found at the location where the remains of Captain Bastedo were last seen (CWGC COG-BR Document 1814102). These remains, exhumed in August 1925, are within 300 yards of the last sighting of Captain Bastedo. It could be him, but this is not conclusive, thus more work is required. Links to various formats of reports that have been submitted and catalogued to date are accessible at: The Unknown Project: Investigative Reports Completed.